Berlin Walk is a spectacular journey through the old and the new and I enjoyed every moment of it. Infact, it is one of my favorite cities in Europe and given a chance I would happily stroll around Berlin for days on end. I am glad I decided to join the walk around town to explore this charming city on foot. We passed by one memorial to another, stopping, looking and feeling the essence of a compelling memory of a time better forgotten in modern times of bloody separation to ultimate reunification. The intended brief stop in front of “Neue Wache” or New Guard House located on “Unter den Linden” the main east-west axis of the city stretched much longer since we were moved by the sculpture located inside right under the skylight. 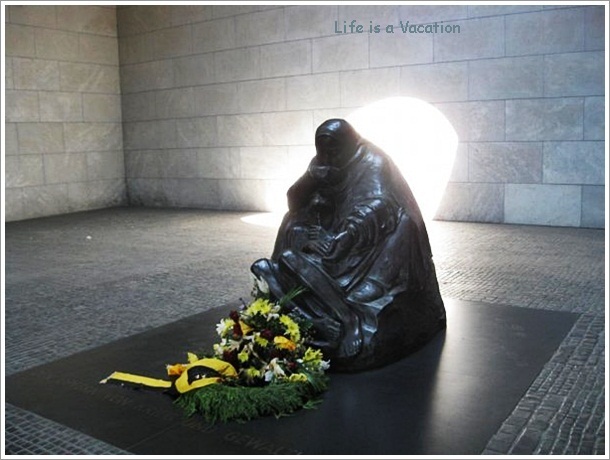 The side note read “Mother and her dead son” by famous Berlin artist Kathe Kollwitz. The dark stone sculpture was beyond stone, it captured the emotions of the mother who had frozen in grief after losing her young son to the perils of war. My eyes were moist and the saline taste on my lips forced me to close my eyes as I connected to the grief. Kathe Kollwitz had lived her grief of losing her son Peter through this sculpture. The afternoon sun gazed through the skylight. Will it warm the mother’s heart that lay inside hugging her dead son one last time I asked? Maybe no and may be yes since time is known to heal. I wonder to myself, when Moon light streams in on a full moon day, will she break into a smile or under the cool breeze of the starry night will she recount days of joy or teach her son to count his blessings under the haze of a snowy morning. One thing it surely does, is remind every visitor of the tough life that this city witnessed during the times of war !! We are born from our mother, she holds us in her womb for 9 long months. All through life her presence is a said and unsaid protection that we all look forward to. In Vedas, it is mentioned that the soul’s journey starts inside the womb and the umbilical cord connects us to her until we see the light of the world. While the physical cord is cut at birth, the invisible one remains and sometimes beyond death since a child resides inside the mother’s heart!! Well said… and especially the last para “We are born from our mother, she holds us in her womb for 9 long months…” . Creativity and intense thinking . Nice share. Its lovely the way you say it was beyond stone… speaks volumes of how expressive it was..
You nailed it Sangeeta, I’m not a mother but somehow I can connect to what your saying…oh motherhood. Hmm..I am not a mother too but watch them all the time, across ages they have the same expression ! !